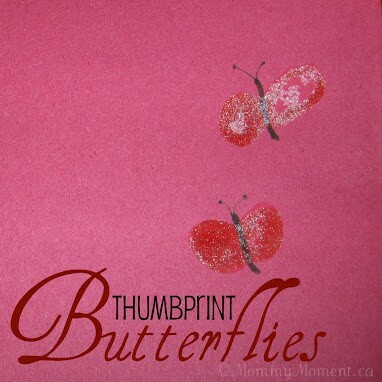 These Thumbprint butterflies are so easy to make and they are absolutely adorable. I always think handprint, footprint, thumbprint and fingerprint crafts make the best keepsakes. These sweet DIY butterflies would be an easy Valentine’s Day craft idea. This idea could be used for a Spring Theme, Butterfly theme or Valentine’s Day. First dip thumb in red paint and place on paper 2 times to make a heart type shape. Then add a body with marker. Look at the beautiful butterfly! Such sparkle! I love the idea of using sugar to make it glittery. What a great idea, thank you! How cute! Which reminds me–I should do finger painting with my kids this week, too! What a simple, fun project! Thanks for leaving your blog address on my blog….I'm enjoying it lots! VERY fun! I'm going to do this with my little ones! Great blog, by the way. I'll be back! Stopping by from SITS. This is such a cute idea. I'll need to try it with my daughter today.